The example of the latter are many, and no one want to become the next Kodak og Blockbuster. At the same time, becoming to eager to expand into adjacent industries is equally risky. Bausch & Lomb is one of those companies who moved beyond its core business into dental products, skin care, and even hearing aids in the 90s with little to no success. Even though these business units are divested today, lack of focus resulted in the loss of leadership position in its core business to Johnson & Johnson. The most well-known example of failed diversification is everyone’s favorite toy manufacturer, LEGO. In the late 90s, LEGO was facing a change in customer behavior. Video games where everywhere and in order to capitalize on these trends, LEGO expanded into clothing, amusement parks, jewelry for girls and video games. Instead of collaborating with someone familiar with these verticals, the company built everything themselves. The gaming division even featured the largest installation of Silicon Graphics supercomputers in northern Europe. As a result, this eagerness to expand too rapidly away from the core led LEGO to the brink of bankruptcy. The answer to turn this development was to go back t its roots and focus on the core business, the brick and the building sets. Unprofitable business areas were shut down, and areas such as amusement parks and video games were divested to companies that have their core business in these areas. The theme parks are now owned and operated by Merlin Entertainment, and even though they are divested by LEGO, the number of parks are expanding across the globe. As for the video game division, former employees started their own company called Travellers Tales, who are making licensed LEGO games today without any direct involvement from LEGO (who have little experience from game development), making good money for everyone involved, including LEGO. By focusing on core business, LEGO has been able to innovate around its core in numerous ways. 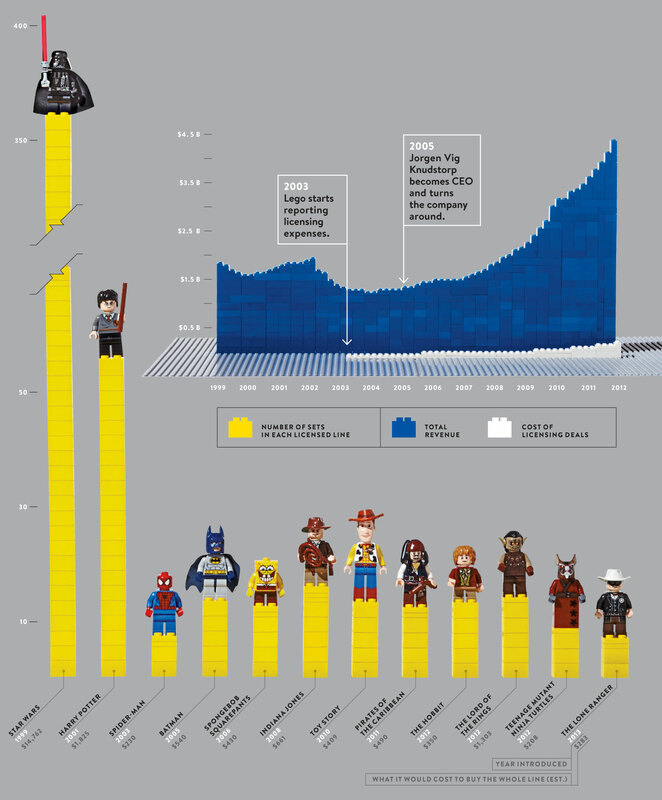 From a rapidly a growing licensed themes business, successful (licensed) movies, engaging the customers in crowdsourcing of ideas through Lego Ideas to expanding the core market to include a growing number of adults who buy Lego for themselves (in 2011, LEGO group estimated that 5% of all sales were adults who bought Lego for themselves). There is no wonder how LEGO got its reputation as the company who rewrote the rules of innovation. Just like Lego, Apple is another company that was facing almost certain death in the 90s and made a legendary turnaround. While it may seem like Apple has expanded far beyond their core by entering the music industry, forever changing the mobile phone industry and continuously pushing the boundaries of their product categories, I would argue that the key to Apples success is to stay true to their core business. Even though iTunes changed the music industry as we know it, iTunes was never a play to disrupt the music industry. It was to create a complementary service that added value to the products in Apple ecosystem. The purpose of the iPod and iTunes was not to disrupt the music industry, it was to complement the Mac. Just like iTunes was the component that allowed Apple to connect their products then, the App store and iCloud serves the same purpose today. Creating a seamless user experience between Apple products, and encouraging users the continue to buy Apple products. While it may seem like Apple reinvented their core by transitioning from the Mac to the iPhone as their flagship product, the core business is never the one single product, but rather how the product is able to deliver customer experience and brand value. The value that Amazon originally provided, for example, wasn’t selling books online but rather providing convenience and wide unprecedented selection through a world-class digital platform. Understanding the real source of its value allowed Amazon to expand exponentially beyond books. For banks this is an important lesson, as the banking industry may still feel invincible as the banking license gives banks an unbeatable competitive advantage. The majority of banking revenues are based on net interest margins, and the banking license is the magic wand awarded by the government that enables banks to transform those deposits into loans by lending out several times more than is deposited into current and savings accounts. Deposits is the key component in the business model, and the dominant funding source for banks, which is also reflected in the net interest margin. However, this would never have been a viable business model without trust. Customers trust the banks with their money and those deposits fuel the banks business model, therefore banks should view trust as their core business in order to prepare for the future. Trust is an asset that is earned over time, and banks must for once stay compliant to receive the necessary trust from the government and regulators to maintain the banking license. Cyber security must be state of the art, and privacy must be at all times considered top priority. Customers no longer accept complex fee and hidden fees, and a truly digital bank must be fully transparent to earn the customers trust. Even though it is difficult to challenge banks on mortgages directly, challenger banks like Revolut, N26 and Monzo are establishing themselves as simple everyday banking solutions based on secure but lightweight architecture and transparency, thus building trust over time. Realizing your true core business is imperative for survival. While one might argue that companies like Kodak failed due to their inability to abandon their core business, the truth is that Kodak confused their most profitable product with their core business. Had they realized that their core business was to capture the a moment in life worth saving,named the Kodak moment instead clinging to the distribution (and revenues) of the physical film, the starting point for reinvention would have been much more favorable. Instead, the expression Kodak moment will go down in history as an allegory for a company that failed to reinvent themselves. Reinvention is key to survival, and deciding whether to challenge ones core business is the one of the hardest situations for every leader to face. Failing to see the true potential of one’s current core business is equally risky as sticking to an eroding business model for too long.